LaRouchePAC – A very institutional grouping of 35 former U.S. military, diplomatic, and intelligence officials warned Thursday that U.S. military strikes on Iran could set back Iran’s nuclear program by about four years, but that the Iranians probably would manage to retaliate, directly and through surrogates, in ways that risked igniting all-out war in the Middle East. The report, issued by the “Iran Project,” was presented yesterday by a panel discussion at the Wilson Center, featuring veteran U.S. Ambassador Thomas Pickering, Dr. James Walsh from MIT (a close collaborator with Pickering on Iran back-channel discussions), and Lt. Gen. Frank Kearney, formerly the deputy commander of the U.S. Special Operations Command. Their starting point is that the U.S. Director of National Intelligence has determined that the Iranians have not made the decision to develop a nuclear weapon, and that therefore, there is no need for a rush to judgment. They also pointed to the well-known “unintended consequences” of military action, i.e., increasing fragility in the region, loss of the international coalition now pushing for sanctions, greater regional and globality instability, and a rallying of the Iranian populace around the regime. Signatories to the report also include: former Central Intelligence Agency Deputy Director Paul Pillar, and former U.S. Central Command commanders Anthony Zinni and William Fallon. Others included Chuck Hagel, Sam Nunn, Lee Hamilton, Richard Armitage, Brent Scowcroft, Leslie Gelb, Anne-Marie Slaughter, Zbigniew Brzezinski, Joe Sestak, Lawrence Wilkerson, and Paul Volcker. After the initial presentations, the first question was asked by Matt Ogden of EIR, who praised their efforts, and then pointed to Rep. Walter Jones’s HCR 107, which, Ogden said, states that if the President launches a new war without Congressional authorization, he will be impeached. Ogden also asked about Gen. Dempsey’s warnings in London about Syria, and pointed to the likelihood that any military intervention would put us into a confrontation with Russia and China. Walsh punted on the war powers issue, saying that was something that Congress and the White House had to work out. Gen. Kearney praised Dempsey as “very well informed,” implying that his warnings should be taken very seriously. Neither wanted to discuss Syria, noting that their report was limited to the Iran situation. 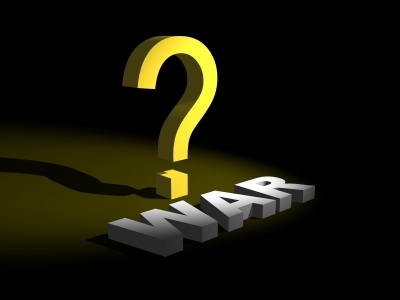 This entry was posted in Geopolitics, World News and tagged escalation, serious consequences, strike, The Iran Project, war, warning, Wilson Center by cnlib. Bookmark the permalink.